People experiencing homelessness are no different, and a significant number of them have pets. According to communications cited in Michelle Lem’s thesis, Effects of Pet Ownership on Street-Involved Youth in Ontario, a study of vulnerably housed adults in Toronto, Ottawa, and Vancouver found that 11.5% of participants owned pets; similarly, a 2009 criminalization survey found that of one sample of homeless youth in Toronto, 12.8% owned pets. According to Rhoades, Winetrobe and Rice, this number could be as high as 25% in the United States. 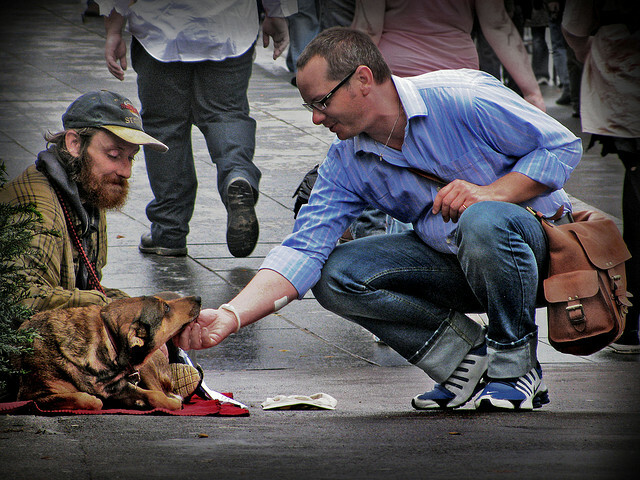 While there is limited research in this area, the studies that have been done all highlight the following as reasons why homeless people have pets. Companion animals, as explored in Paws for Thought and this UK study, are often more than just pets. For many people, especially those experiencing homelessness—whose social networks are usually extremely limited as a result of their homelessness—bonding with an animal is a great source of love and companionship. In one study of homeless adults in California, 74% of pet owners said that their pet was their only source of companionship and love. Similarly, a study of homeless women living in shelters in 6 Canadian cities by Labrecque and Walsh found that nearly half of participants cited attachment as the primary reason for owning a pet. Participants also identified: the unconditional acceptance due to the non-judgemental nature of pets (39%); and a source of comfort (51%) as other important reasons to own a pet. Of these women, 82% reported feeling loss after having to surrender their pets in order to stay in shelters. In her thesis, Michelle Lem found “a universally high level of pet attachment among this unique pet owning population [homeless youth], providing opportunity for youth to experience not only beneficial emotional and social support, but also the negative emotional consequences of pet loss.” She also found that youth with pets reported lower rates of depression. Owning a pet comes with great responsibility and this isn’t lost on homeless owners. 28% of the homeless women in Labrecque and Walsh’s study mentioned this during their interviews. This sense of purpose, responsibility and accountability from animal companionship can be transformative in the lives of people experiencing homelessness. One of the most compelling studies in this area is Leslie Irvine’s Animals as Lifechangers and Lifesavers: Pets in the Redemption Narratives of Homeless People. She interviewed homeless people in Boulder, CO and San Francisco, CA who were visiting street vet clinics and asked about their pets, resulting in very moving stories. Several people said their pets helped them manage their addictions. Tommy adopted a stray dog named Monty after his release from jail. He’d stopped using alcohol and drugs by necessity, but said it was having Monty around after tthat helped him stay clean. Another interviewee, Donna, had a similar story with her adopted dog Athena, who she credits for her sobriety. All these reasons aside, keeping a pet while homeless has a few challenges. Having a furry friend often prevents people from staying in shelters. In Toronto, where the homeless population is largest, there is only one that welcomes dogs and cats: Bethlehem United Shelter operated by Fred Victor. As a result, many people experiencing homelessness face a difficult decision: stay on the streets with their pets, or surrender the animals so they can stay in a shelter. Clearly, establishing more shelters with pet-friendly policies would alleviate the sense of loss from losing a pet, get more people off the streets, and avoid contributing to already overcrowded animal shelters. Between buying food and providing veterinary care, owning pets isn’t cheap. In Aline Kidd and Robert M. Kidd’s study of 105 homeless adults, 55% of participants said vet care was an issue, and 44% had located a free clinic. Though inconsistently implemented and not always available, street clinics organized by groups like Community Veterinary Outreach are important in maintaining the health of pets with homeless, vulnerably housed and/or low-income owners. Getting pet food was also an issue, according to the same study. 58% admitted that feeding their pets was often difficult, but they found ways to do so: 9 people gave their pets their own food or used it to supplement their pet’s; while the other 12 said they always fed their pet first. For other homeless pet owners, providing food is less of an issue. In Irvine, Welsh and Kahl’s study, Confrontations and Donations: Encounters Between Homeless Pet Owners and the Public, many participants said that they incorporate pet food into their budget. Food was also reported as being frequently donated by passers-by, pet stores and animal organizations. People experiencing homelessness keep pets for all the same reasons housed people do: love, companionship, and a sense of purpose. In many cases, they find ways to provide beyond adequate care for their companion animals.